The first step in creating a new future for Magnolia Manor Park is the "Schematic Design" phase. During this phase, a "Steering Committee" group (see "Who We Are"), representing a cross-section of the community, guides an open process to help the neighbors of the park create a vision of what it should transform into over time. The output of this process is a "Schematic Design", which is a high-level description (in words and graphics) of the selected plan, and a high-level estimate of the cost of constructing and maintaining the Design. For the Schematic Design phase, the Steering Committee enlists the help of a professional landscape architecture firm, selected through an open bidding process. Local firms interested in participating submitted a response to a "Request for Qualifications" (RFQ) by the published deadline of December 29, 2010. A selection process will follow, at the end of which one of the firms will be selected. 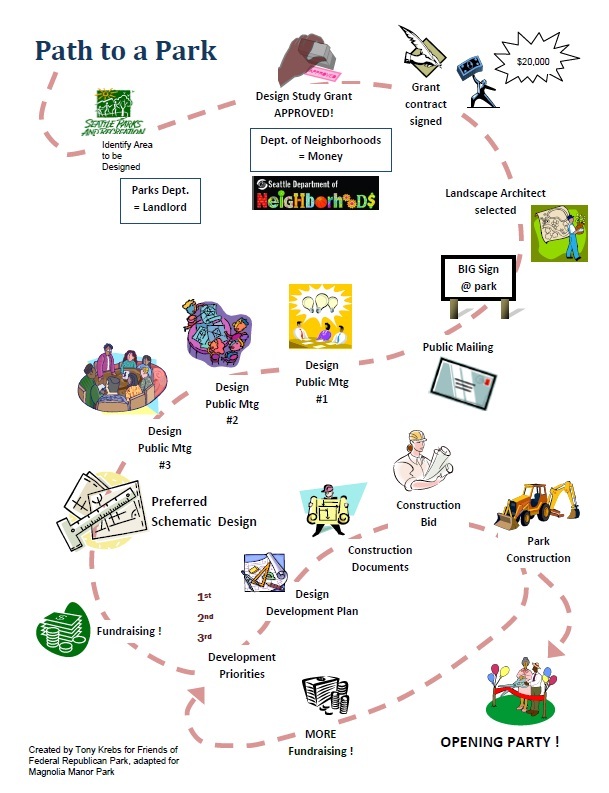 It is this first step, the Schematic Design phase, which has been funded through a $20,ooo Small and Simple Neighborhood Matching Fund award from the Department of Neighborhoods. The Steering Committee expects a Schematic Design to be selected and delivered to the Department of Parks and Recreation by mid-Summer, 2011. The next steps, none of which are funded or scheduled, are "Design Development", "Construction Documents", and "Construction". The "Design Development" and "Construction Documents" steps take the Schematic Design to greater levels of detail, and "Construction" is when the plan is actually built. Funds for these remaining steps are secured through fund-raising efforts or grants. See "Schedule and Milestones" for details on the current project schedule, or "Who We Are" for information about the community members serving on the Steering Committee.